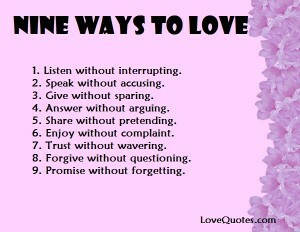 Nine Ways To Love 1. Listen without interrupting. 2. Speak without accusing. 3. Give without sparing. 4. Answer without arguing. 5. Share without pretending. 6. enjoy without complaint. 7. Trust without wavering. 8. forgive without questioning. 9. Promise without forgetting.